Starbucks’ Ethiopia Sun-Dried Sidamo Coffee is a blend that has been available for a couple of weeks now, but I hadn’t gotten around to trying until recently. 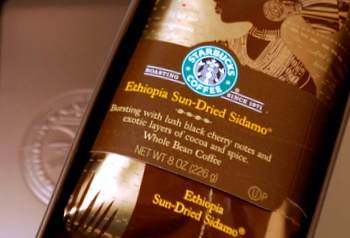 It’s a limited edition blend and, like the Aged Sumatra that I tasted a few weeks back, it comes in a 12-oz bag inside a custom box bearing the Sidamo logo (some sort of tribal-looking sun/mask). I have to say that I am a bit more partial to the Sumatra’s tiger logo, though that doesn’t impact the coffee in any way. The information that comes with this coffee basically says that the beans are produced using one of the oldest coffee-processing methods around: sun drying. Many mass-produced beans are stripped from the inside of the coffee cherry, fermented mechanically and then tried. Sun drying beans simply means that the beans are left inside the coffee cherries and the fruit-like cherry is allowed to dry out naturally, leaving a shell that can easily be removed from the bean. The Sidamo has a medium-dark roast, much lighter than the aged Sumatra, and has a much smokier flavor, with strong cocoa notes. It is fairly light bodied and seems to have a fruity, slightly acidic finish. While it’s a nice coffee, it’s not as distinctive and rich as the Sumatra.